Stroke of Luck appeared in the Osprey summer mystery series, various Osprey newspapers and in Mystery Ink: an anthology of mystery stories by Ontario writers, edited by Jake Doherty and Therese Greenwood (Ginger Press 2007). 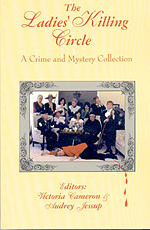 Kicking the Habit in Menopause is Murder: A Crime and Mystery Collection edited by Victoria Cameron and Mary Jane Maffini, (General Store Publishing House, 1999). Downsized to Death (Storyteller Winter 1999). Full Moon, Blue Lake was published in Cottage Country Killers: A Crime and Mystery Collection, edited by Vicki Cameron and Linda Wiken (General Store Publishing House, 1997). Cotton Armour in The Ladies Killing Circle: A Crime and Mystery Collection, edited by Victoria Cameron and Audrey Jessup (General Store Publishing House 1995) Reprinted in The Arthur Ellis Awards: An Anthology of Prize-Winning Crime and Mystery Fiction, (Quarry Press 1999). Death Before Doughnuts won Ottawa Citizen Write Now! contest, 1994.